Why should you donate to our Annual Campaign? Your tax-deductible donation helps preserve our U.S. Air Force history and heritage and funds aircraft restoration, new exhibits, and educational programs like our popular aviation summer camp. Read the full campaign letter below to see why we need your support. 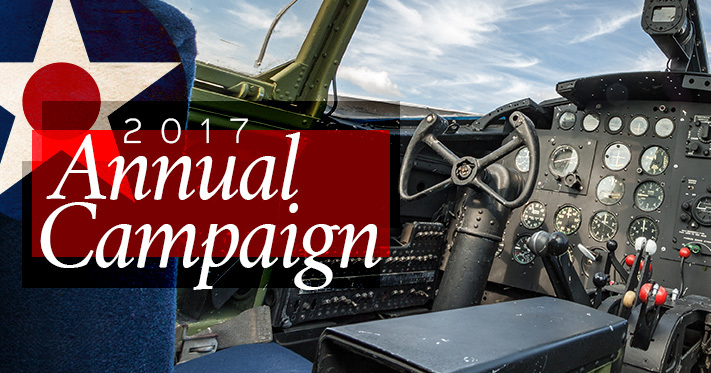 Donate $50 or more and be entered into a drawing for a sightseeing flight in a vintage PT-17 Kaydet (flown out of Massey, MD), or an aviation art print—your choice! If your donation is through PayPal, we will be in contact with you after your donation to ask for your preference. Donate $100 or more and receive an AMC Museum dog tag and customize your own dog tag! If your donation is through PayPal, we will send you a custom order form to help you customize your dog tag. The drawing will be held on December 7th at the foundation’s meeting. Please submit your donation no later than November 30th to enter for the drawing. Thank you for your consideration and ongoing support!